Looking for a way to easily irrigate your veggie garden? Have you considered wicking beds? Wicking beds were originally designed by an Australian engineer for use in Africa and work well where water is precious and in very hot and dry environments. A wicking bed is a raised bed that has the ability to hold water and this water is then drawn upwards (or wicked) to the plants roots. 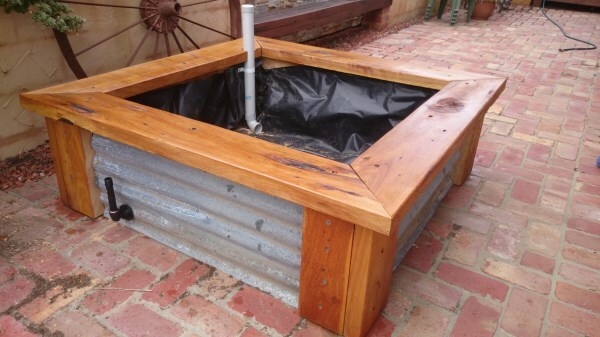 Wicking beds are traditionally raised timber or corrugated iron beds with a plastic liner to hold the water reservoir; however they can also be made using old baths, wine barrels, plastic containers etc. 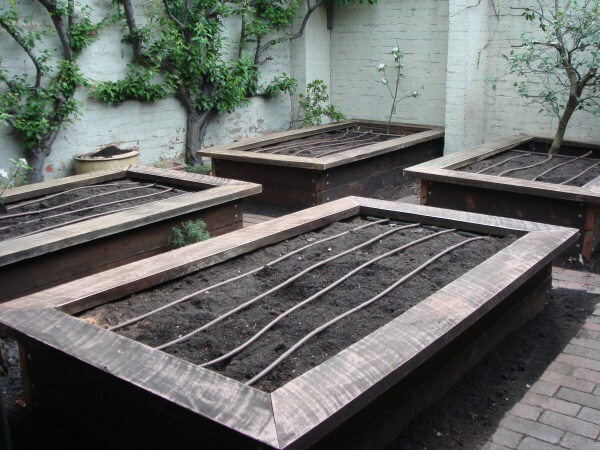 Yummy Gardens make wicking beds using cypress macrocarpa, corrugated iron tanks or ironbark and build the bed the same as for any raised veggie bed. We then install a plastic liner into the raised bed. A 50mm PVC pipe is then used to provide a water reservoir to the bottom of the bed and a base of scoria is added. A geotextile membrane is then added to stop the veggie mix that is added from mixing with the scoria or entering the PVC pipe. Excellent for very dry areas especially where water is a concern. Great for areas where large trees or plants have invasive roots or where creeping grasses are present. As they hold a water reservoir Wicking Beds do not need to be watered daily, and are fine if you are away for a couple of weeks. The bed is always in a state of dampness or wetness which does not suit all plants. The veggie mix should be changed every couple of years as it is basically an enclosed container growing veggies. The cost and labour input is more expensive than raised beds with drip irrigation. At Yummy Gardens we can help you with your wicking beds or alternatively set up drip irrigation to your raised beds. My personal preference in most situations is for drip irrigation due to its simplicity and because the bed is in contact with the soil below which allows earthworms to do their thing, it is also easy to fork over the soil and top it up with compost seasonally. We are happy to sit down with you and discuss the benefits of both systems to help you decide which will best suit your requirements, backyard and lifestyle.